High School for Coburg: Can you help spread the word about the HSC Q&A forum? Can you help spread the word about the HSC Q&A forum? 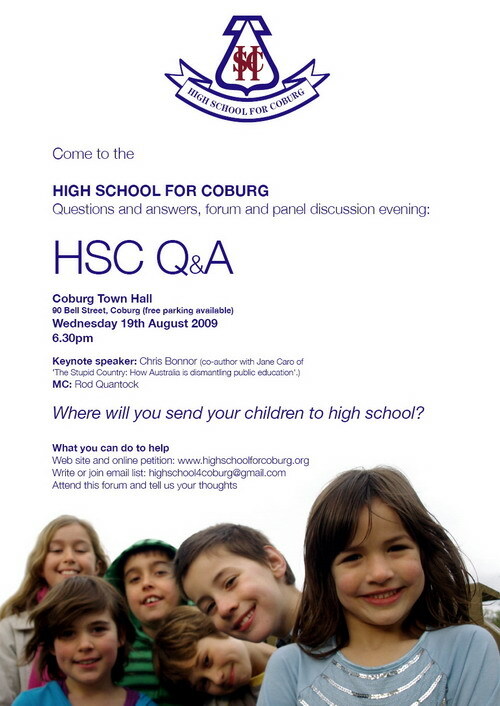 Next Wednesday night, the 19th of August 2009, High School for Coburg are hosting a Questions and Answers, forum panel and discussion evening at Coburg Town Hall. Full details are here. Our poster is available for download in English and in Greek on our resources page over here. Please help us spread the word! Thank you. there is such a buzz around this event! yes, but a shame there wasn't a huge turnout, and that some of the speakers (particularly the woman who writes for The Age) did such a disasterous job in speaking! WHAT was she on about?! Next time don't waste so much time and get to the guts of the discussion. The gentleman who spoke about Fitzroy High's battle was fabulous, but also indicates that it's a hard road and I don't think he has much faith in our compaign. Let's plug along and see what happens next!